Successfully Added Audio Max - Wireless Headphone + MIC to your Shopping Cart. Serenade in ecstasy with the Audio Max headphones! Designed for the most comfortable and enjoyable audio experience. Whether you're into gaming, IM chats, or just listening to music, this particular set of headphones with its Built-in MIC will leave you immersed in a world of your own. Comfortable, powerful and with a great base line. This is the perfect wireless audio gadget that gives you the freedom to roam around your home or office. This wireless headphone is extra cushioned for superior comfort. It perfectly envelopes your ears to shut out external sounds, thus, letting you enjoy an enriched audio experience that is available only to you. 1- Plug the USB transmitter to any USB port on your personal computer or laptop. 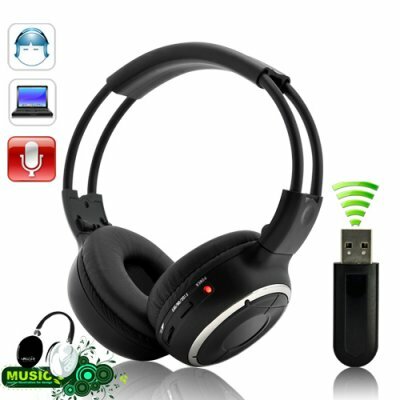 2- When the Green indicator starts to flash on the USB Receiver, press the power button on the wireless headphones to sync. 3- Start using your brand new high quality wireless headphones! This amazing audio gadget comes with a wholesale price tag, and is perfect for re-selling online on your drop ship storefront or eBay-listing page. As always, Chinavasion brings you the best wholesale electronic gadgets directly to you. Built-In MIC - Enjoy talking on Skype, MSN, Yahoo, Gtalk with the freedom to move around the office. Will the wireless headphones instantly reconnect when I walk far enough from the receiver and lose the wireless connection? Yes, you can feel comfortable moving around the office, and once your back within range, the headphones will automatically reconnect with the wireless receiver. I must say that the sound is pretty good for the price. I dont think you can find a better headset for this price.